Today we ventured back to the sea. Lemon Tree Passage is on a little penninsula that means even though our desinations is not far away on the map, the drive is a long way around. There are a few beaches we wanted to explore on the southern side of Port Stephens. We started with One Mile Beach (Johanna uderstandably exclaimed, 'How many one mile beaches are there?' - we seem to have come across a few!). The headlands and tight crescent were very pretty. The surf boards are having a rest, our new commodore hire car can accommodate our soft racks but the board overhang front and back makes is a bit much to cart them around all day. You can see the region from the link below ... Stockton Beach (see comments below) stretches west of Anna Bay. As we moved along the coast, the swell became more impressive as the beach orientation changed. At Boat Harbour we stopped and watched the rough seas crash into the rocks ... that was just an entree for what was to come. Stockton Beach is awesome in the literal sense rather than the teenage exclamatory sense. The sand dunes behind it are rolling hills of pure sand that go on for kilometres. The beach was closed when we arrived due to the massive swell that thundered constantly. Not sure how far it curves around, but is is many kilomentres. The beach is flat and expansive ... everything about it today was big. Sharing it with us was a camel train and numerous four wheel drives. 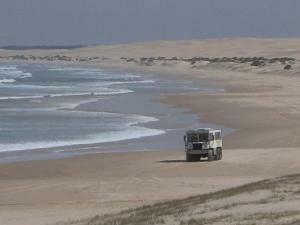 The dunes are a major tourist attraction with operators taking day long 4WD excursions. Perhaps the most striking sight was a bus load of Japanese tourists. Now Australia has extraordinary beaches, but Stockton beach today was something special. So awestruck were these Japanese that they were drawn into the shallows in their clothes and then - I know this sounds strange but it was understandable given the context - they were standing as a group, hands outstretched as if worshipping the sea, shouting and taking in the enormity of the environment. Sometime over the next couple of days we will check out Fingal Bay, a bit north of where we started today. A neighbour back in Tuncurry/Forster told us they thought it was one of the nicest beaches in NSW. The map suggests there is a walking track out onto the headlands so we will no doubt go for an exploratory wander. Looming large is the reality that our privileged yurting season will soon be over for this time. We have had such an amazing time. But as we reminded ourselves today, it is not the caravan that gives us peace and joy. We are fortunate that we share an easy relationship and have tried hard to cultivate lifetsyle habits and perspectives that enable us to make the most of whatever situation we are in. This means that while this season comes to an end we will be managing the transition to our Brunswick urban way of being. There is so much about that that we love too. Where are the people like us?